Sovereign Silver - Bio-Active Silver Hydrosol™ is a dispersion of silver particles in water that has many therapeutic benefits. Silver has been used for centuries as a first line of defence against bacteria from ancient civilisations using silver vessels to keep water fresh, to American settlers putting silver dollars in their milk. Smallest average particle size ever seen - 0.8nm (nanometers)/0.008 microns/8 Angstroms - confirmed by electron microphotography. With colloidal silver, the smaller the particle size the greater its energy. With a confirmed safe, low concentration of 10ppm (parts per million) with the daily dose falling well below maximum reference dose (RfD) of 350mg, as set by the Environmental Protection Agency (EPA). Knowing what are the safe and critical amounts of silver ingestion is important, you must use a product which allows for multiple daily doses whilst remaining safe and below RfD set by EPA. 96% actively charged particles over 150million particles of active silver in every drop, giving incredible total area and therefore energy for reaction. Naturally bio-available based on particle size and total dispersion, Sovereign Silver moves freely through the body following ingestion. Ultra pure and free of binding proteins or other stabilisers. Colloidal Silver is a dispersion of silver particles in water that has many therapeutic benefits. With colloidal silver the smaller the particle size and finer the dispersion, the more effect the colloid will have due to a greater area of action. Sovereign Silvers manufacturers, Natural Immunogenics, have examined more than 60 commercial brands of silver colloid under electron microscopy and has determined that no other brand comes close to the minute particle size and exceptional particle distribution that Sovereign Silver displays. Since ancient times silver has been highly regarded as a premier preservative and immune support. In Ancient Greece, Rome and Macedonia, silver has been used extensively to help control many immune challenges. Hippocrates himself, the Father of Medicine, used silver. Developed in the Natural-Immunogenics laboratories, countless people are turning to Sovereign Silver, the most respected silver immune support supplement on the market. In the late 1800s and early 1900s colloidal silver was beginning to be understood and its uses more widespread but was limited by its cost and Silver was left behind. The technology now exists to produce far more superior silver colloids such as Sovereign Silver, at a far more reasonable cost than previously possible. Pharmaceutical grade purified water and silver (10mcg/ml [ppm]). Silver has a long history of safe use in a diverse range of applications in healthcare, person hygiene (including feminine douching). Apply topically as necessary. Use Sprays or droppers for ears and nostrils. For oral use, swish 1 or 2 teaspoons around the mouth for one or two minutes, then expel. Affected by fungus, bacteria or viruses. Apply or spray as needed. Avoid sources of magnetic energy and extremes of light. There are no known safety issues associated with typical use of this product for adults, children, animals or plants. Below are reviews of Bio-Active Silver Hydrosol - Dropper - 59ml by bodykind customers. If you have tried this product we'd love to hear what you think so please leave a review. Heard about this from an online dental seminar. Have used colloidal silver before but this stuff seems so much more effective. Been swishing as a mouthrinse for 2 days and already mouth and gums (with a painful ulcer) are responding positively. No longer have a nasty taste in mouth when wake up either. Excellent product and already recommended to friends. This is the most soothing silver hydrosol I've used and a great price also. I use it as a skin tonic to soothe and calm irritations and help with any breakouts, in fact I just don't get them now. Happy with 118 ml so have just bought larger bottle. Fantastic and safe product to use even on children. 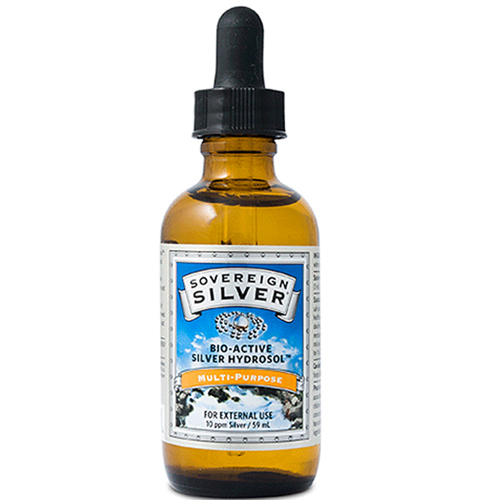 Sovereign Silver - Bio-Active Silver Hydrosol is a dispersion of silver particles in water that has many therapeutic benefits. Silver has been used for centuries as a first line of defence against bacteria.